This page will provide information to navigate around the music section and the various ways to play your music. Kodi is primarily designed to be used with a correctly programmed remote control. To use the Library mode you must, at a minimum, have Scanned your music into the library. If you have not already completed this step, the Library mode will be unavailable to you. Either follow the Create your Music Library Guide or read File Mode below. 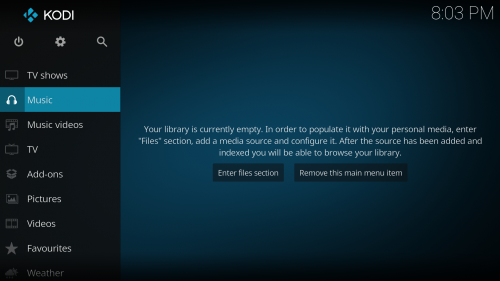 This image displays the Kodi Home Screen with a scanned library. The left quarter of the screen shows the vertical menu and the remainder of the screen shows the Home Screen for the selected menu item. 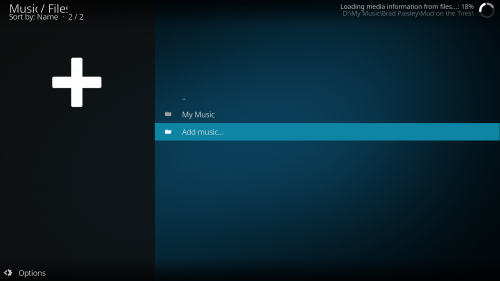 In this image we have highlighted the Music menu option and the right portion of the screen is displaying the Music Home Screen. Selecting Music from the main menu will display the default Music Category list as shown in Image 2. From this screen you select how to navigate your music library eg. Artists, Albums, Songs etc. Using File Mode is a very limited way of using the Music Library. It is similar to using the File Browser in your operating system to navigate your music files in the folder structure you created. Navigate to your desired album or song. The Sideblade Menu can be accessed using the Library or File Modes. There is limited functionality when using File Mode. bringing the mouse cursor to the left side. The image to the right shows the Sidebar Menu with Party Mode activated. If Party mode is deactivated, the entries below Party Mode will not be available. Change current library view. Options differ depending upon location. Party Mode is context sensitive. The music used in the Party Mode Playlist will depend on which screen you invoked Party Mode from. Open Play Mode screen. Displays Fanart and song information. aka Now Playing screen. To commence music playback locate the desired song, album, artist or any other category and select the item to be played with the appropriate remote control button, Enter on a keyboard or use the Context menu. Select a song for immediate playback using your remote or keyboard. 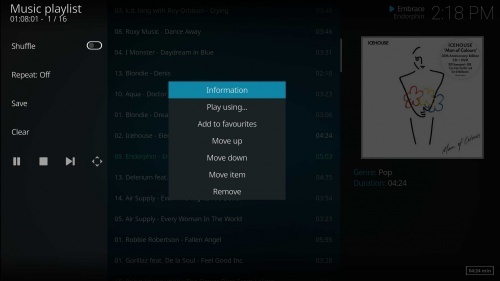 Alternatively, using the Context Menu for the highlighted song, either play or queue the item into the playlist as shown in the above image. Highlight any Album or Artist. Call up the Context Menu and select Play for immediate play or Queue item to add the selection into the playlist as shown in the above image. Highlight any Category item such as year, genre etc. Call up the Context Menu and select Play for immediate play or Queue item to add the selection into the playlist as shown in the above image. From the Now Playing screen, the controls as shown in the above image are available. They can be accessed by Enter on a keyboard or the appropriate button on your remote control. To access the Now Playing screen see the Sideblade Menu, or it will self activate after a period of inactivity by the user. User playlists are created by the user to meet specific requirements. When music is selected and playback commences, a temporary Playlist is created. This playlist will contain the song selected for playback, plus the remaining songs in the list which enables continuous playback. For example, if a song is selected from an album, then all songs in the album will be added to the playlist with playback always commencing at the selected song. If a song is selected from the Song Category, then all songs in the library are added to the playlist. Basic playlists - Kodi supports both basic playlists and smart playlists. A basic playlist is a normal text file that lists one or more media files (Audio or Video), and plays them in succession. You can either create your own or use existing playlists from other sources, such as a playlist generated from Winamp, iTunes, or other sources. 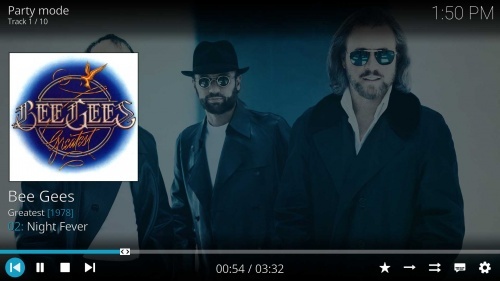 Basic playlists can be created and edited directly from Kodi's GUI. 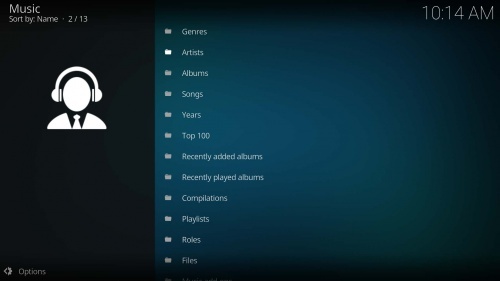 Smart playlists - Kodi supports smart playlists for all types of media (excluding pictures), which essentially use a set of rules to limit the results from the databases. This means that to be able to create a smart playlist in the GUI, music/video must first be added to the libraries using a scraper addon or by creating NFO files. Smart playlist can be created either by using the built-in GUI smart playlist editor accessible from the Playlists section, or by creating an XML file with the extension XSP (XBMC Smart Playlist). Shuffle- Disabled by default. Once enabled, songs will playback in random order. Repeat- Off by default. When enabled, will repeat the playlist once the end of the list is reached. Save- Save the current playlist. This allows you to create playlists to be saved and easily played back. Clear- Will clear the playlist. Once the current playing song ends, music playback will end. The Party Mode is a quick and simple option to create a continuous playlist of all music in the library. This mode uses Random order and Repeat playlist to ensure music never ends. As the name implies, a great way to set and forget music playback for parties. Normal navigation controls such as pause, stop and next track are accessible. Previous Track is not available. A global search function is availabe from the Home Screen and is the Search Icon at the top left of the screen next to the Settings Icon. The Global Add-on is required to be installed for this to function. As of v11 (Eden), Kodi has very limited support for being an AirPlay target, allowing any device/platform that can run Kodi to receive some AirPlay content. Music nodes are defined views that are used to organize your media from the music menu. 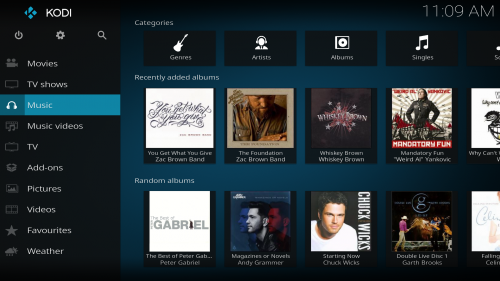 In the past Kodi has had a number of standard nodes such as Artist, Album, Tracks that were hard coded. As of v15 Isengard, Kodi introduces the ability to customize these nodes using an XML file. Using XML files really gives great flexibility in how you display your media and lets you browse large collections quickly. Don't want your country music in your main album node... exclude it. Want a genre in a separate node, create it. Don't like how Top 100 Played is presented, change it. To get full functionality from custom nodes, you need to use a skin that allows you to deploy them as you would like (e.g. latest builds of Aeon Nox). Confluence will show your nodes, but doesn't allow you to decide exactly where. This page was last edited on 2 March 2018, at 09:20.